There’s a Band for you at UNI - Join a Band! 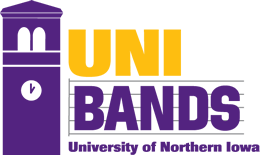 UNI Bands welcomes serious music students majoring in music as well as non-majors with the desire to continue their artistic growth through performance in band. UNI Bands is the home of 8 ensembles for both majors and non-majors alike. Concert Ensembles feature our flagship UNI Wind Ensemble, Symphonic Band, and Concert Band, and Athletic Bands are centered around the incredibly popular Panther Marching Band, with opportunities to perform with our two UNI Pep Bands, Winter Drumline and Winter Guard. We take great pride in our ensembles at UNI and invite you to join an Athletic Band or audition for a Concert Ensemble. With so many wonderful opportunities we know There is a Band for you at UNI!